Newcastle United dropped into the Premier League's bottom three as relegated Aston Villa ended a run of 11 defeats amid more fan protests. Villa supporters, angry at the running of their club, halted the match briefly in the 74th minute by throwing beach balls on to the pitch. 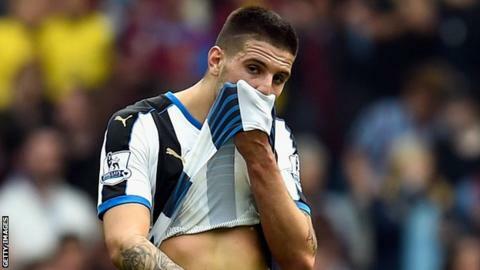 Aleksandar Mitrovic headed wide two good second-half chances for Newcastle. Sunderland, who beat Chelsea, would relegate Rafael Benitez's side with victory over Everton on Wednesday. Newcastle's last relegation from the Premier League, seven years ago, was confirmed with a soporific final-day defeat at Aston Villa. Against opponents in turmoil off the pitch, and without a Premier League point since 6 February on it, Newcastle once again paid a heavy price for lacking adventure at Villa Park. Benitez's side managed just one shot on target in a dreadful first half, as Papiss Cisse mis-hit a volley into the ground from Vurnon Anita's cross. They showed a little more urgency in the second half, with Jack Colback firing over a good chance seconds after the the restart, but still not enough to merit a victory. Mitrovic's introduction as a substitute for the ineffective Cisse saw the visitors begin to create more chances. Having lobbed over when put through by Cheick Tiote's hooked pass, the Serbia striker headed wide when well placed, before missing the target again from Chancel Mbemba's delivery, while Georginio Wijnaldum's shot was beaten away by keeper Mark Bunn. The result did extend Newcastle's unbeaten run to five matches, but they now need help from elsewhere to stand any chance of survival. Aston Villa fans have become increasingly enraged during an embarrassing season, which has featured a series of protests at recent games. Supporters registered their frustration this time by bringing hundreds of beach balls into Villa Park, and throwing them on to the field to disrupt play. One first-half Newcastle attack took place with a giant inflatable football inside the six-yard box, but the main protest took place in the 74th minute, a time picked by fans because Villa were founded in 1874. Amid the chaos, Villa did at least manage to avoid a 12th successive league defeat, which would have beaten the club record set in 1963, and equalled at Watford last weekend. That they earned a point was thanks in part to Villa defender Ciaran Clark, who threw himself in the way of a late Wijnaldum shot to block. The Premier League relegation battle is set for a fascinating finale over the next eight days, with former Liverpool manager Benitez now needing a huge favour from Everton. Roberto Martinez's side can keep alive Newcastle's survival hopes on Wednesday by avoiding defeat at Sunderland, who will relish the opportunity to relegate their great rivals. Sam Allardyce's team came from a goal down twice to beat Chelsea 3-2 and climb out of the bottom three - and, like relegation rivals Norwich, they have a game in hand on Newcastle. It leaves the prospect of Benitez, a manager who began this season in charge of Real Madrid, starting next season in the Championship. Aston Villa ended a run of 11 consecutive Premier League defeats with this point. Villa have won none of their past 10 Premier League games against Newcastle United (D5 L5). The Magpies have scored just 13 goals in their past 25 Premier League away games. Newcastle have gone 11 Premier League games on the road without winning (D2 L9). Despite this, Rafa Benitez's side are unbeaten in five in the Premier League, their best run since November 2014 (when they went six matches unbeaten). There have been just four goals scored in the past five Premier League meetings between these two teams. Aston Villa caretaker-manager Eric Black: "Last week, the performance at Watford merited more, but we built on that, worked tirelessly all afternoon and the supporters came with us. I thought the reaction was brilliant. The Villa fans have got a big part to play in getting this club back to the Premier League. "It has been difficult to play in a relegation battle, but we have got some outstanding footballers and I thought we coped with them today." Newcastle manager Rafa Benitez: "We are disappointed. Sunderland won, so all we can do now is wait for the score of their game on Wednesday and try to win our game. "We had to change things in the second half. We did that, but it was not enough.."
Newcastle end their season at home to Tottenham on 15 May, the same day that Villa bow out of the Premier League at Arsenal. Match ends, Aston Villa 0, Newcastle United 0. Second Half ends, Aston Villa 0, Newcastle United 0. Paul Dummett (Newcastle United) is shown the yellow card for a bad foul. Rushian Hepburn-Murphy (Aston Villa) wins a free kick on the right wing. Attempt saved. Andros Townsend (Newcastle United) left footed shot from outside the box is saved in the top centre of the goal. Vurnon Anita (Newcastle United) wins a free kick in the attacking half. Foul by Ashley Westwood (Aston Villa). Corner, Newcastle United. Conceded by Kevin Toner. Corner, Newcastle United. Conceded by Alan Hutton. Attempt blocked. Georginio Wijnaldum (Newcastle United) right footed shot from the centre of the box is blocked. Assisted by Ayoze Pérez. Moussa Sissoko (Newcastle United) wins a free kick in the defensive half. Substitution, Aston Villa. Rushian Hepburn-Murphy replaces Scott Sinclair. Attempt missed. Alan Hutton (Aston Villa) right footed shot from a difficult angle on the right is too high following a set piece situation. Jordan Ayew (Aston Villa) wins a free kick in the attacking half. Scott Sinclair (Aston Villa) wins a free kick in the defensive half. Attempt missed. Aleksandar Mitrovic (Newcastle United) header from the centre of the box is too high. Assisted by Chancel Mbemba with a cross. Corner, Newcastle United. Conceded by Leandro Bacuna. Delay in match Carlos Sánchez (Aston Villa) because of an injury. Delay in match (Newcastle United). Attempt missed. Aleksandar Mitrovic (Newcastle United) header from the centre of the box is close, but misses to the left. Assisted by Jack Colback with a cross. Attempt saved. Georginio Wijnaldum (Newcastle United) right footed shot from the right side of the box is saved in the centre of the goal. Assisted by Andros Townsend. Substitution, Newcastle United. Ayoze Pérez replaces Cheick Tioté. Offside, Aston Villa. Jordan Ayew tries a through ball, but Scott Sinclair is caught offside. Attempt missed. Aleksandar Mitrovic (Newcastle United) right footed shot from the centre of the box is just a bit too high. Assisted by Cheick Tioté following a set piece situation. Moussa Sissoko (Newcastle United) wins a free kick on the right wing. Aleksandar Mitrovic (Newcastle United) wins a free kick in the attacking half. Offside, Newcastle United. Moussa Sissoko tries a through ball, but Georginio Wijnaldum is caught offside.